I found it strange to not have a snowflakes embossing folder so I used what I had on hand. I also did not have the new pinecone die so I improvised by using the tattered floral die to make my pinecones! I think they turned out pretty good. The word Peace was cut from grungeboard using my cricut, I also made my own bead not sure what to call them charms? baubles? I had fun making it. Cheryl, I'm glad you did! Donna, this tag is LOVELY!! 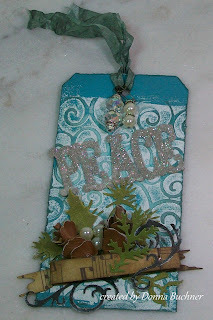 The cool blue (reminds me of snow flurries) you used and the embellishments you added ALL support and enhance the "Peace"fulness of your tag. Tim Holtz 12 tags of Christmas Tag 7! !